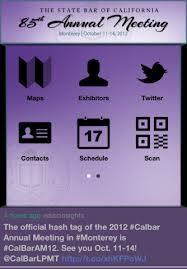 #CalBarAM12: From Hash Tag to App! 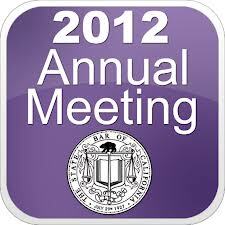 If you're attending the State Bar of California 85th Annual Meeting this week in Monterey – or want to stay abreast of the action (because as you know, lawyers are synonymous with action…) there's an app for that. Available for both Apple and Android devices, you can monitor the #CalBarAM12 hash tag on the fly, organize your meeting/CLE/reception calendar, find maps to various meeting locations and the city itself, share contacts dynamically and a whole lot more! Folks, the Bar's effort here is truly impressive. I'm very proud of my colleagues who made this happen. Plus, the LPMT Section's Social Media SubCommittee gets a little credit as well – we named it and also created the companion hash tag. Soon, our Section will release our own app, so stay tuned for that announcement as well. In the meantime, safe travels!